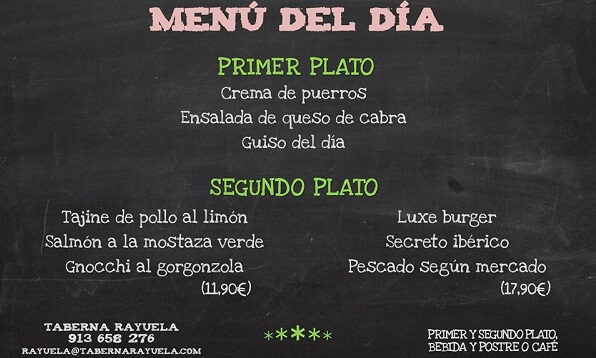 Imagine if you could have lunch in the best restaurants in Madrid for less than 15€. After 17 years running the only Tapas Tour in Madrid specialized in Spanish Wine ?, I can safely say that the biggest mistake tourists make is not knowing what the MENU OF THE DAY/DAILY MENU is. 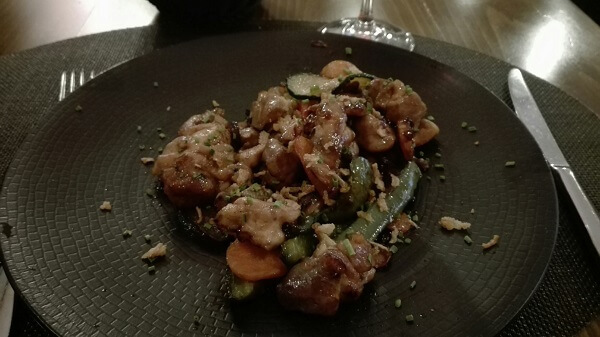 ⋅ It is a fixed-price lunch restaurants offer from Monday to Friday (as long as it is not a holiday). The price ranges from 10 to 15 euros and covers: starter (primero), main (segundo), dessert (postre) or coffee, one drink (bebida) and bread (pan). ⋅ It is either written on a piece of paper, you must ask the waiter for, or on a blackboard outside the restaurant. ⋅ It is not translated into English (tourists are not supposed to know about it). Google Images is the best tool to decipher it. Fantastic place! Cleaner than a hospital, beautiful, right in the city center and a different paella every day included in their “menu del día”. The kind or restaurant you visit and want to bring all your family the next day. 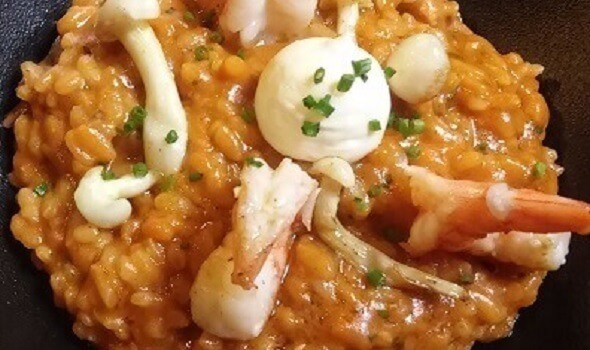 They publish their menu del dia every day at about 11.30 am so that you can see what type paella is included in it. There is one in Calle de Trujillos, 9 and another across the street. Casa Parrondo is run by two brothers, 300 pounds each. You just have to look at them to tell how seriously these two take food. IMO the best place in Madrid to have lunch for 12 euros. 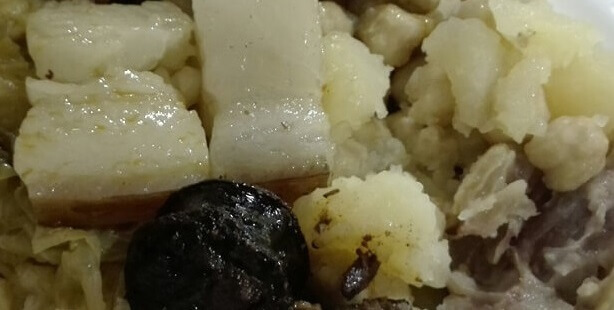 Awesome dishes are: Ensaladilla rusa, cochinillo, cordero, puerros, cabrito and many more. Santa Rita, Outstanding Cuisine and Barbacue! Unusually good cooking, everything is delicious. 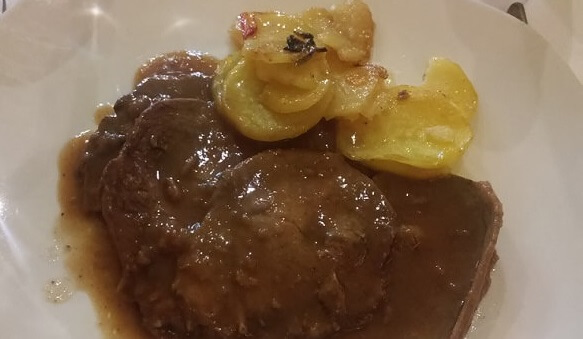 They have a charcoal (brasa) oven (see video) and there is always a roast dish in their menu del dia, look for the word “brasa”. We had the roast hake (merluza a la brasa) and we all agreed it was the best we had had in our lives. The charcoal oven gives a delicious flavor to the dish. 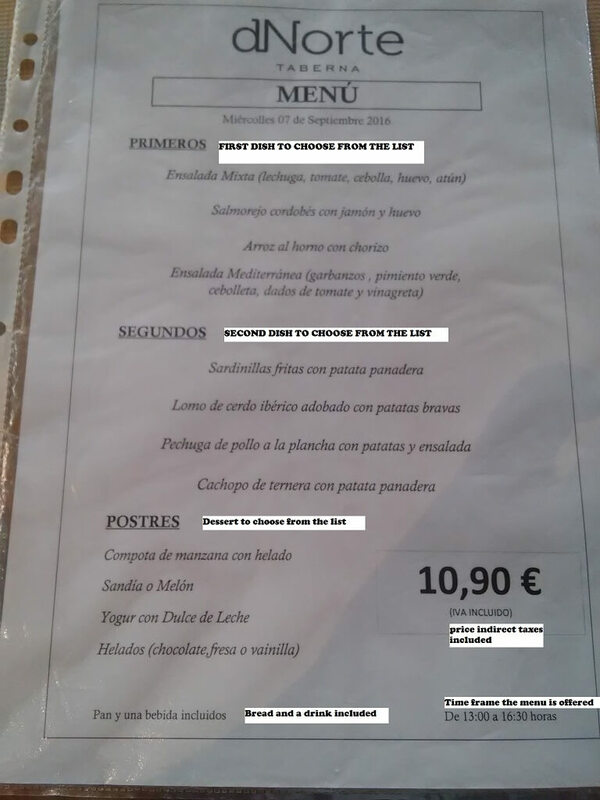 Menu del dia price: 13.9 euros. The menu of the day is only 11,95 euros. If you want the suckling pig (Paletilla de cochinillo) you have to pay a supplement of 4 euros, do it without a doubt. There must be at least two of you to order it. It comes with a cup of gravy you have to pour over the pork. 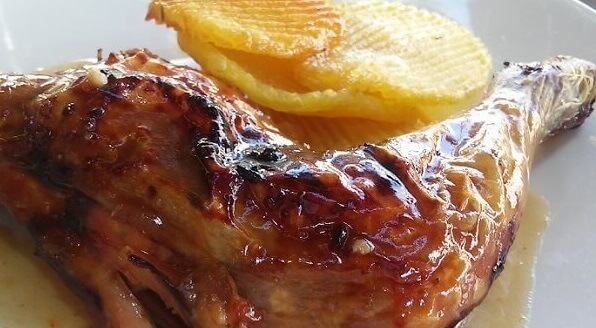 The crunchy skin of the pork and the gravy are to die for. You can see all the dishes of the menu of the day by visiting the restaurant’s website and clicking on Menu. This restaurant is perfect if you visit the Royal Palace of Madrid in the morning because it is just a couple of minutes away. Right in the center of the Chueca neighborhood. 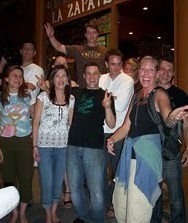 It is a restaurant and an organic food market at the same time. It is in a courtyard and there is natural light, very pretty. The menu is only 14.5 euros and all the food is organic and very good. 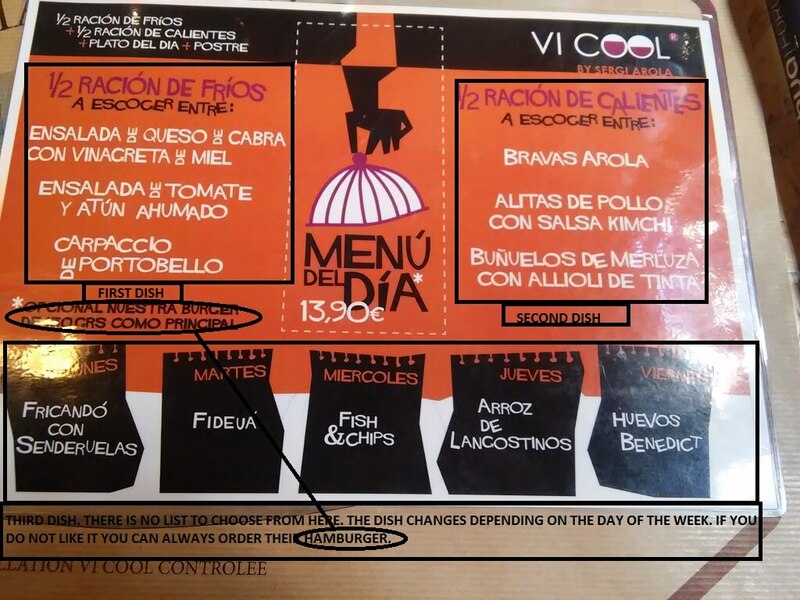 Their menu del día costs 13.90€ and covers 3 dishes but it doesn’t include a drink. 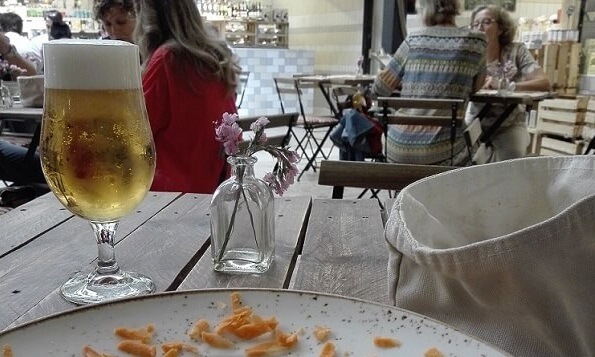 I ordered a caña (small glass of beer) 2.90 €. This is the best meal I have ever had in a menu del día. The menu has a confusing design I must clarify, take also into account that they offer three dishes instead of two. Fast without rushing, professional and vibrant. All the food I had was outstanding including one starting tapas. 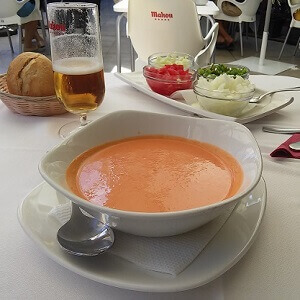 I had gazpacho (tomato soup), beef stew and tarta de Santiago. Even though I was by myself they gave me half a bottle of very good white wine! and all for only 12.8 €! 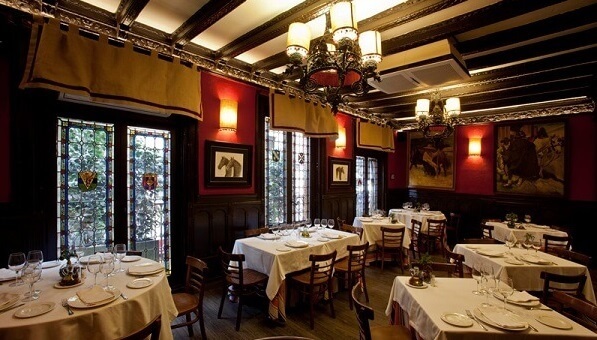 Founded in 1894 and one of the best traditional restaurants in Madrid. 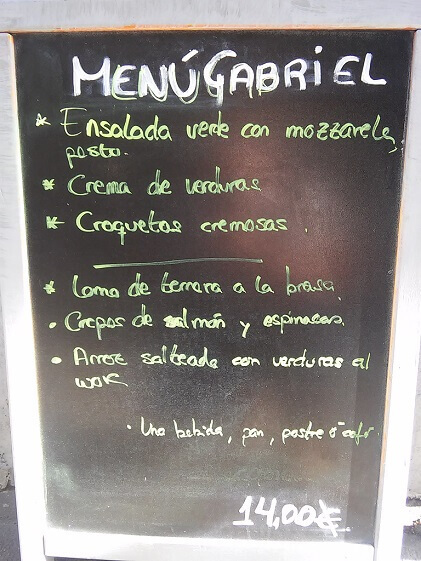 You will see the menu del día written in a small paper outside the restaurant. You can also ask the waiter for it but they are not used to foreigners doing so, you may have to insist. I particularly like going upstairs, it is so beautiful up there (picture). Los Galayos has two terraces, one in Botoneras street and the other in Plaza Mayor. Their menu is pretty good considering it costs only 12.9 euros. 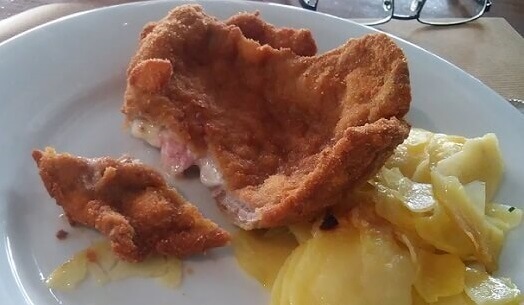 If you see “cochifrito” and you like pork, order it, this dish will make your day. They speak English. They don’t offer the menu del dia during Christmas. A dream come true. It is in the city center but in a street off the beaten path. Cozy and small, great local atmosphere. Lovely white wine. Outstanding food. 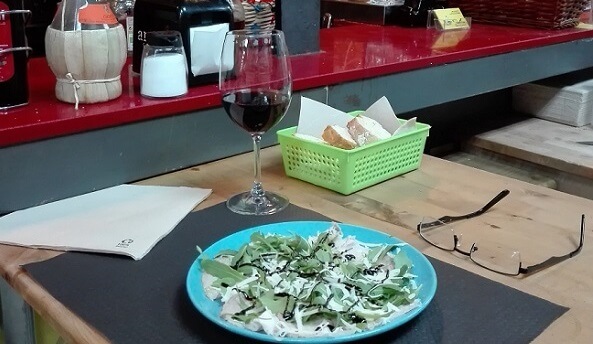 I had goat cheese salad, ribs and Pionono (traditional Granada dessert), all for 15.50 €. These people are so amazing that they upload their menú del día on the internet every day. BEAUTIFUL restaurant and bar, I love it upstairs. Very good food, I had the chickpea salad and the cachopo (beef, ham and cheese). This is real great value, 11.9 €! The restaurant is inside the Fine Arts Palace, needless to say how beautiful it is. It also has a terrace in Alcalá st. 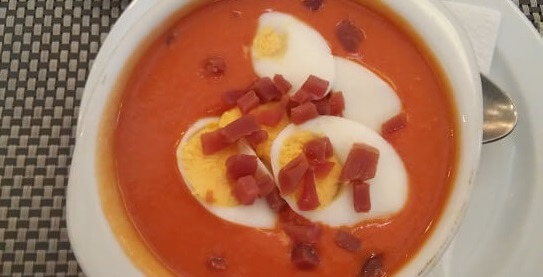 The menu del dia is 15 euros in the restaurant and 17 in the terrace. The food is not as good as Vi-cool but the location is unbeatable. This tiny bar is inside the Antón Martin market. You will not see the name anywhere but you can right away see it since it is the only Italian bar in the market. It is run by young Italian people and I found their menu del dia delicious. Very good italian cabernet into the bargain. Also very inexpensive, 9 euros. I have only been once. Great atmosphere and service. The Cocido, a traditional Madrid chickpea stew, was very good. I also noticed that the Codillo (pork knuckle) looked great. Only 12 euros. El Escorial is a village 50 miles away from Madrid and famous for its palace, the most important XVI century one in Europe. The name of the restaurant in the train station is Posada y Fonda and every time I go to El Escorial I have lunch there. The steak and the gazpacho are my favorites.